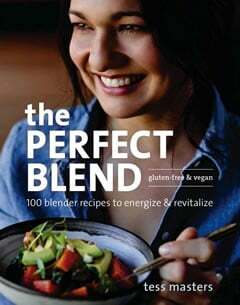 This is an excerpt from The Blender Girl Smoothies book and app. Fruit smoothies are delicious and easy to make. But to reduce sugar spikes and bursts of inflammation, I recommend a moderate intake of these sweet treats and a higher consumption of alkaline-forming savory smoothies. The complex carbohydrates contained in these gazpacho-style blends are more slowly absorbed and metabolized than the sugars in fruits. Now, before you screw up your nose, remember that savory smoothies are ostensibly cold soups, and can contain flavor profiles that you may be familiar with and perhaps even enjoy! 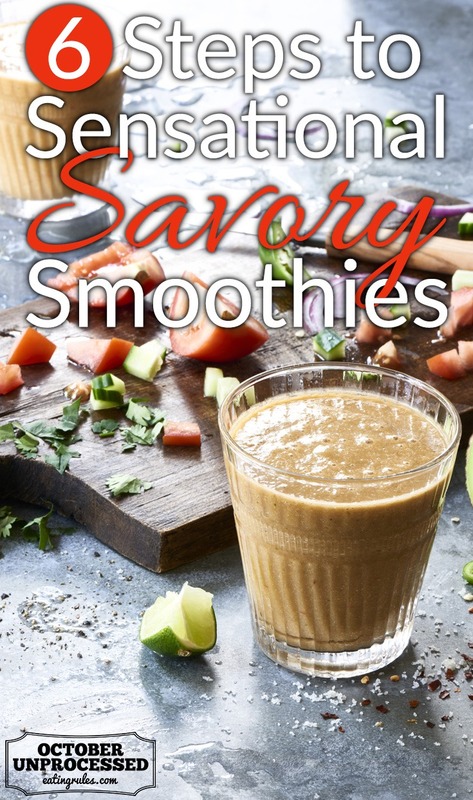 Savory smoothies can be really tasty when you layer the flavors in appropriate ratios, and utilize herbs, spices, salt, citrus, and other flavor enhancers to create combinations that are dimensional. But, the most important tip is to get your blenders really, really cold. Our taste buds are temperature sensitive, so chilling smoothies takes the edge off the bitterness and pungency of earthy ingredients like beets and leafy greens. 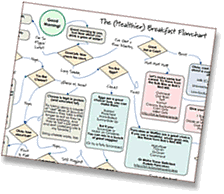 Rather than blocking your nose, closing your eyes, and drinking a glass of slimy sludge that looks and tastes like swamp water, use my fool-proof formula that will help you create savory smoothies that look and taste amazing. A 32-ounce/2 serving smoothie typically requires 1 to 2 cups of liquid. If your blend contains high-water-content foods like tomato, cucumber, melon, or apple you may need little or no liquid. Add 2 to 3 cups of base ingredients to the liquid. I find that a combination of several ingredients yields the tastiest results with savory blends. A smooth texture is a non-negotiable element of a savory smoothie. Raw fruits and vegetables can give you a “wet salad” mealy consistency that can be funky. To prevent this, select one item (or sometimes two) from the list below. If your base ingredients already deliver a creamy or frosty texture (mashed vegetables, avocado, or frozen fruits), you may not need to add anything. For maximum nutrition and to alkalize blends, adding some leafy greens. With savory smoothies, you don’t have as much sweet fruit to mask the flavor of greens. So, go easy, and add gradually to taste. I seize every opportunity to add superfoods, frozen vegetables, and supplements to any blend. Adding the items below in the prescribed quantities won’t change the flavor of your blend unless otherwise specified. Aromatics will be your lifesavers when creating savory smoothies. The ingredients below will transform funky into fabulous. Try some of these additions in the prescribed amounts, and add gradually to taste. 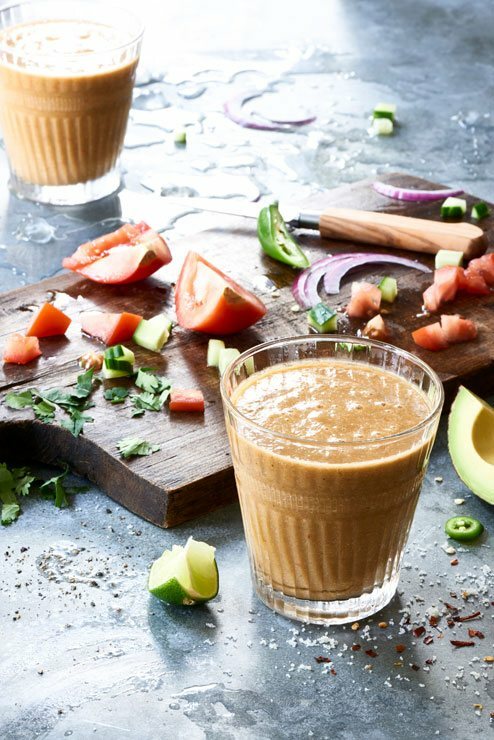 Here’s the Spicy Tomato Gazpacho smoothie from The Blender Girl Smoothies app. Throw everything into your blender (including any boosters) and blast on high for 30 to 60 seconds until smooth and creamy. Tweak cilantro, onion, pepper, and pepper flakes to taste. Recipe from The Blender Girl Smoothies app. Photo by Trent Lanz; styling by Alicia Buszczak.